Over the two and a half years I’ve been developing Possession with Purpose you’ve heard me go on about this game not just being about scoring goals it’s about winning. I don’t mean that in the sense that you don’t need to score goals to win; you do. But what separates winning from losing statistics wise? And if there is separation, what is it, and what value does it bring? I collect these data points for every team, for every game; all 646 from last year and up to 102 (61 Games) so far this year. In looking at the data this year the below diagram offers up the averages of those 7 data points, for all games, up to the end of Week 6. The blue bar is the overall Average for all games regardless of points earned, the green bar is the Average for all games where teams took three points, the amber bar is the Average where teams took one point, and the red bar is the Average where teams got nil-pwa. The table just beneath the bar graph indicates the raw numbers (averages); for example the average Successful passes for teams that lose (in the Final Third) is 73.13; their average Shots taken is 13.39; their average Shots on goal is 4.10 and their average Goals scored is .58. Teams that win average 50.30% Possession versus teams that lose average 49.70% Possession. Teams that win average 76% Passing Accuracy across the Entire Pitch. /// teams that lose average 74% Passing Accuracy across the Entire Pitch. Teams that win average 71% Passing Accuracy in the Final Third. /// teams that lose average 64% Passing Accuracy in the Final Third. Teams that win average 22% of all their Passes Attempted in the Final Third /// teams that lose average 25% of all their Passes Attempted in the Final Third. Teams that win average 17% Shots Taken vs Completed Passes in the Final Third. /// teams that lose average 18% Shots Taken vs Completed Passes in the Final Third. Teams that win average 40% Shots on Goal vs Shots Taken. /// teams that lose average 31% Shots on Goal vs Shots Taken. Teams that win average 45% Goals Scored vs Shots on Goal. /// teams that lose average 14% Goals Scored vs Shots on Goal. While 2% difference in overall Passing Accuracy might not mean much it should be noted as a reasonable indicator on how well a teams’ Passing Accuracy will be in penetrating the Final Third. That 2% difference translates this way. When a team makes 500 pass attempts. 76% * 500 Passes equals = 380 Completed Passes. 74% * 500 Passes equals 370 Completed Passes. Any one of those unsuccessful passes could be the pass that gets you that goal or leads to the Opponent making an interception (quick counter) that gets them a goal. Perhaps it is easier to understand why some coaches say control of the game and possession adds value? Those teams that are more accurate in their overall passing are more likely to win. In looking at Passing Accuracy within the Final Third there is a clear difference between winners and losers; winning teams are 9% better in Passing Accuracy within the Final Third… this is not about volume of passes – it’s about the accuracy of those passes. To put that into perspective say a team attempts 100 passes in the Final Third; 71 of those passes (71%) are successful for the winning team whereas only 64 (64%) are successful for the losing team. That difference of 7 (within the tight confines of the Final Third) could make a BIG difference; those 7 extra completed passes could be 7 through-balls, key passes, or crosses that lead to a goal versus no goal. Note that losing teams take more shots (on average) per pass completed (18%) than teams that win (17%). Is that an indicator that the less effective team is trying to compensate for lower skill levels/overall passing accuracy by increasing their shots taken totals? I think so. And when looking at the ability of a winning team to put a shot taken on goal (a more accurate shot) the winning teams do that 9% better than losing teams. And that initial accuracy then translates to a huge, if not inordinately large, difference between a team that wins versus loses; 45% of shots on goal are goals scored for winners versus 14% for losers. Now for the second diagram and the R2 for the overall average, wins, draws, and losses with the backdrop lines being the real numbers for all 102 games this year.. The “x and y” axis represent the same things as they did in the first diagram. The Blue, Green, Yellow and Red lines represent the averages ‘in trend-line format’ seen in the above diagram with their corresponding exponential correlations. I selected the Exponential Relationship as opposed to a Linear Relationship because I think it best represents the drop off in passes (in total) versus those just within the Final Third; the R2 will remain the same regardless. That tight difference in R2 means there is a very tight margin of error between winning, losing and getting a draw; and if you’ve watched a game you know a single mistake can cost you three points. However tight, there is a difference between the R2 for winning teams versus losing teams. Is that statistical difference associated with those percentage differences indicated in the first diagram? I think so, and while Possession (itself) is not “the” prime indicator on whether a team wins or loses it is “an” indicator that should be considered, when viewing overall passing accuracy within and outside the Final Third. Perhaps the TV pundits will take more time to show better graphics where the Final Third data (in possession percentage) is separated out from the overall possession data? Perhaps another view that may be helpful to others is the ‘space available’ that gets leveraged in creating that goal scoring opportunity? I don’t know if this data is representative for teams in Europe – but the data certainly supports that view for teams in Major League Soccer. To reinforce the End State (winning) from a different viewpoint. Last year the top five teams in volume of shots taken versus passes completed in the Final Third were Chicago, (26%), Philadelphia (26%), FC Dallas (26%), Montreal (25%) and Columbus (23%). Only one of those teams made the MLS Playoffs – Montreal. This year the top three teams with the highest volume of shots taken versus passes completed in the Final Third are Montreal (28%), Chicago (28%) and San Jose (26%); two of those three teams are the current bottom dwellers in the Eastern and Western Conferences. In all this I’ve not talked anything about defensive play… more later this year on how teams perform without the ball with specific focus on defensive efforts (collectively and by individual defensive action) within the Final Third. Do you think teams that defend better do so as a team (collectively) or is it individual actions like clearances, tackles, interceptions or recoveries that stand alone? And does the general formation they play to (advertised as ‘the formation’ in the MLS recaps) show results differently in how a defense performs? And does the relationship of the individual or collective defensive activities relate better to unsuccessful passes in the Final Third? My intent will be to answer these questions, and more, as the data piles up (figure once the 17 game mark is reached, for most MLS teams, I will have enough to offer a reasonable view on what is and isn’t of value. 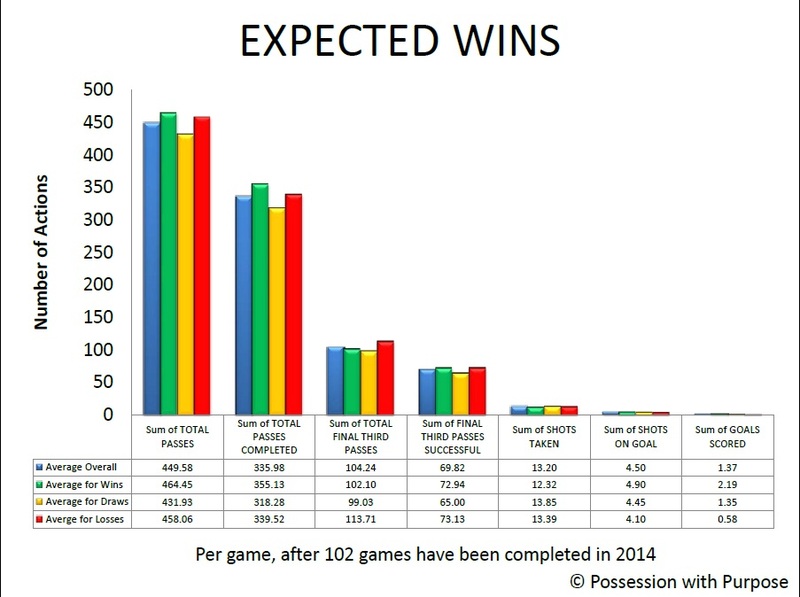 With respect to the data discussed here – I have the 102 games here and the 646 games from last year. The Attacking Index is the relationship those seven data points have with respect to the six steps in the PWP Process. The Defending Index is the relationship the Opponents seven data points have with respect to the six steps in the PWP Process. The Composite Index is the difference between those two Indices. This year, at this time, the overall Correlation of that analysis is an R2 of .7658 – the R2 for Goal Differential is .8729. Bottom line here is that the PWP Composite Index has the 2nd highest R2. With that you should have a better feel for what goes on behind the scenes to get there as opposed to just looking at Goal Differential. The more data points collected the more relevant the R2. How this plays out by the end of the season is unclear but as a reminder the overall PWP Composite Index was 90% accurate by the end of the 2013 in showing what teams would make the playoffs and what teams wouldn’t. Starting for Week 8 my PWP-Pick-List will offer up my prognostications about a team either winning or losing… no more draws will be offered up as no one team ever goes into a regular season game wanting to get a draw. A draw is good but the intent of a Head Coach is to win first. 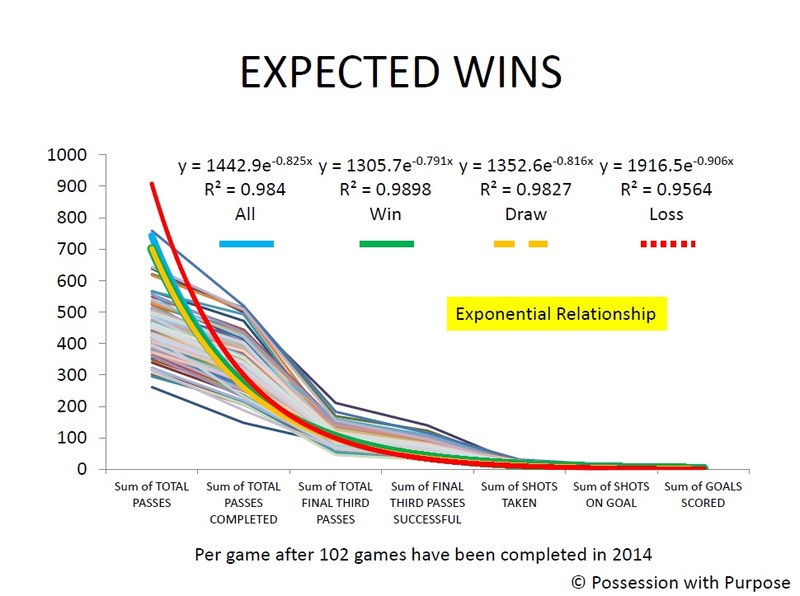 Expected Wins is all about what it generally takes to win a game versus lose a game; it’s not about getting a draw. Expected Goals is an ‘effect’ relative to Expected Wins and the ‘causing’ relationship between those seven data points; i.e. the combined effort of a team as it possesses, passes and penetrates with purpose. Hence my phrase offreed up some time ago “quality beats quantity”. And yes, set-pieces win games, and sometimes the team getting those and scoring from those does that against the run-of-play; I suppose that is why the R2 for wins, draws, and losses is so close. However viewed, teams play to win and score goals. Various strategies and tactics may be used depending upon location, game state, game conditions, team formations, player selections, or what’s needed to move on, if in a knock-out or other tournament type condition. This entry was posted in Possession Stats Analysis, Possession with Purpose, Team Analysis and tagged Expected Wins, Possession with Purpose. Bookmark the permalink. Terrific work as always. I could explore alot of facets of this post but the information that really sticks out to me is the poor performance of teams that have a higher percentage of shots compared to final 3rd passes completed. It’s fascinating because it’s somewhat counterintuitive at face value. I think 2 things could be going on. 1. The teams with a higher percentage could be taking quicker shots, which we would presume to be worse shots than they could have otherwise gotten. We could examine this by looking at the shot location data. I have done this for the Union in 2013 and their shot locations were slightly above average last year so it’s not likely they were rushing and taking worse shots (but this could be the case for the other teams). What was interesting about the Union is that their strikers were quite good at shooting with around a 15% finishing rate and their midfielders were very poor, with a finishing rate around 5%. Jack Mac, who is very much considered a poacher, was the reason the Union finishing rate close up was well above average. And Casey was also effective in close as he isn’t known as a precise finisher. Which brings me to my 2nd idea. 2. Those teams could have a strategy of playing a longer ball into the box once they reach the final 3rd. This could result in roughly the same shot locations. And in essence the teams would be “going for it” early. In the case of the Union they could be hoping for chaos in the box and a poaching finish inside the 6. This would put more demand on the defense I would guess as the team would be giving up possession more readily for a chance to score. Either way your data and analysis suggests that either 1) being impatient in the final 3rd or 2) playing long balls in the final 3rd is a poor strategy and one that shows a team that lacks quality and creativity when it matters most. Here is a bunch of data on Union shooting tendencies for reference from the ASA data. Jared, Thanks for your kind words, additional thoughts and sharing your article; very interesting and should provide for a great comparison given the changes made with the Union this year. I look forward to that especially since it appears to me the Union are playing more possession-based as opposed to direct-attacking based this year. Two great points in #1 and #2 above and I think there is still much to do in seeing how this works out for individual teams. With only 7 games of data available it’s not the ideal tool to draw individual team comparisons; perhaps by Week 17 there will be enough sample points for each team to peel this back team by team. When we get there I sense your individual team data will have great value in considering both #1 and #2. In addition; when beginning to look at individual teams I’ll also want to see how the opponents do against each of the teams to see the balance between those 7 data points from an attacking view as well as defending view. In other words after 17 games the Philadelphia Union have these average data points in attack when they win, lose or draw and their opponents, in their attack against Philadelphia, have these average data points and whether they won, lost or drew against Philadelphia… hope that makes sense. In thinking about all of this a bit more, one thing of huge interest to me is how these data points relate to each other in leagues outside the US; for example – what R2 shows up for teams that win, lose or draw in the EPL, Bundesliga, and all the other major competitive leagues across the World? Perhaps some of our counterparts in Europe or elsewhere might be able to have data available on how these relationships appear? I imagine the R2 distribution may be somewhat different; however viewed perhaps it helps provide an apples to apples comparison for the leagues reviewed?